Sheffield Hare Personalized Address Plaque - - decorative address sign features a playful bunny happily sharing whatever is growing in your garden. Made in USA. 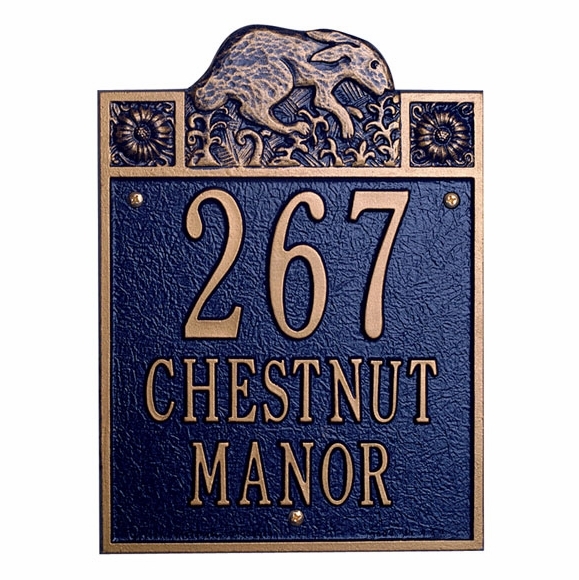 Wall mount address plaque is made to order in your choice of 16 color combinations and up to three lines of personalization. The one-line version holds up to three 4.5" numbers or four 3" letters. The two-line version holds up to four 3" characters on line 1 and up to eight 1.25" characters on line 2. The three-line version holds up to four 3" characters on line 1; eight 1.25" characters on line 2; and eight 1.25" characters on line 3. If you are ordering a one- or two-line sign, please leave any unnecessary input boxes empty. Decorative upper panel contains the partially cut-out Sheffield hare and a rosette in each corner, all in raised relief. Color combinations: BG black plaque with gold characters; GG dark green plaque with gold characters; AB antique brass; RG red plaque with gold characters; DG dark blue plaque with gold characters. Or BS black plaque with silver characters; GS dark green plaque with silver characters; RS red plaque with silver characters; DS dark blue plaque with silver characters; WG white plaque with gold characters; WH white plaque with black characters; BW black plaque with white characters; AC antique copper; OG bronze with gold characters; TI taupe with ivory characters; PS pewter with silver characters. Note: for colors AB antique brass and AC antique copper, the plaque and characters are the same color so there is little contrast. See Related Products for other personalized signs in the Sheffield series.